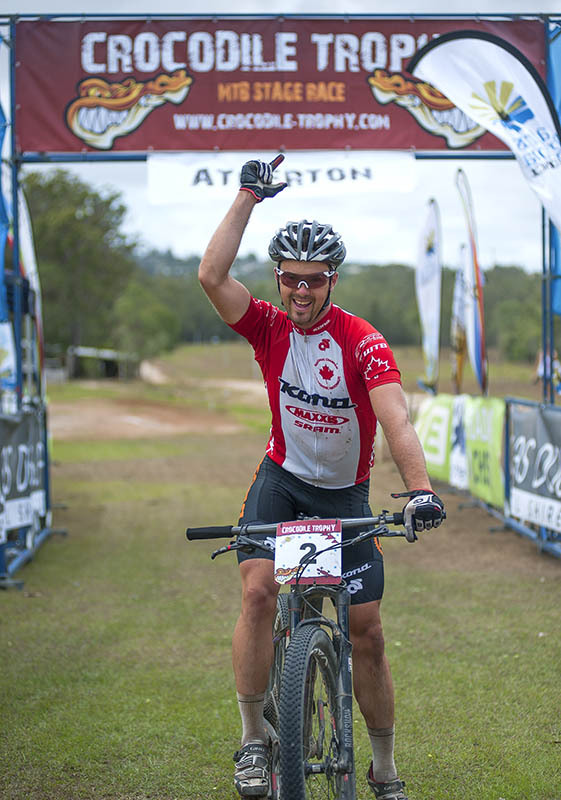 While the overall race lead remains with Atherton's Greg Saw, today the Crocodile Trophy camp is celebrating its fourth elite stage winner with Cory Wallace. The Canadian National Marathon Champion finishes almost three minutes ahead of Ramses Bekkenk (Ned) and Greg Saw after a wild ride, literally, only narrowly escaping the attack of a wild bull. The Austrian Guido Thaler achieves a personal best at the Crocodile Trophy with a fourth place ahead of Milton Ramos (Esp). The Elite Women Imogen Smith calls today's stage "the best one yet". Today's stage had been a wild ride, said Cory Wallace, as he crossed the finish after 3:11:10.81, which pushed him up into third overall and only half a minute behind Ramses Bekkenk (Ned) who advanced into second place after four stages. "On the first section before the technical feed zone suddenly there was this herd of wild cows and this black bull - it was huge - was chasing us", Wallace recounted the close encounter with the "locals" that must have motivated him to pedal even harder, because he arrived at said feedzone with a 2-minute gap to a chaser group including Bekkenk, Greg Saw, the Austrian Guido Thaler and Milton Ramos from Spain, who weren't as lucky as Wallace. They had to duck and dive to get away from the bull. "I've raced the Crocodile Trophy three times already, but that was the single scariest moment so far", admitted Wallace. "That bull's horns were wider than my handlebars", confirmed Greg Saw, who was forced off the track, crashed and suffered nasty rashes from a Stinging Tree, a vicious native plant, to escape the wild animal's attack. Austria's Guido Thaler was happy with his fourth place and said that he enjoyed the many different terrains and settings that the race track offered today. "There were long, steady climbs, which really suit me, especially now that I've finally recovered from my jetlag. The sandy sections reminded me of home - it was like riding in snow", he drew an unexpected analogy. While several riders in the mid-field reported snake sightings on various sections of the tough race track, Ramos lost almost 10 minutes against the overall leader Saw and drops back to fourth place in the general classification. In windy conditions, today's stage had riders climb to the top of the Great Dividing Range, which is Australia's most substantial mountain range and the third longest land-based range in the world. The range stretches more than 3,500 kilometres from the northern tip of Queensland all the way through New South Wales and deep into the southern Victoria. Because of its location near the coast and specific topography, it is a relatively well-watered and fertile area - the Atherton Tableland region is one of the "fruit bowls" of Australia. "This must have been the best Croc stage ever", the rider from Sydney proclaimed at the finish today. "It just had everything - open fire road climbs, dark and moist jungle trails, sandy sections, rocky descents, river crossings - it was hard, but I actually really enjoyed it", she added. With her strong performance and positive attitude Imogen Smith has earned the respect of fellow racers and the men in particular. "I am the only Elite Women this year, so when I ride, after an hour or so, I try not to let any of the guys overtake me, it keeps me motivated on a long day", explained Imogen Smith today. "The Crocodile Trophy is a really friendly race and I enjoy the atmosphere out on track and in the event centre", she added. The fastest amateur woman today was Sandra Starkey from Melbourne and Rita Esteves still leads the category by almost one and a half hours after four stages overall. Rita Esteves chose the Crocodile Trophy and Australia as her honeymoon destination and her new husband Tiago Silva won in the male amateur 30+ category, adding another boomerang to the family collection after Rita's stage win yesterday. And again the Canberran riders were victorious - Andrew Hall keeps the amateur leader jersey, Jason Chalker in the 40+ and Garry James in the 50+ categories. Ondrej Slezak successfully defends the "Best Australian" leader jersey yet again.